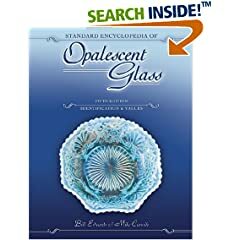 Joseph Locke, lead designer for Cambridge Glass (part of the New England Glass Company in East Cambridge, MA) and Edward Libbey of The Libbey Glass Company of Toledo, Ohio patented amberina glass in 1883. Amberina glass is readily identifiable by its unique color tones, shading from red at the top to amber at the bottom. Amberina glass has gold combined into the molten glass mixture, and you can find both pressed and blown versions of amberina glass. . After the glass form had been blown, shaped, or molded, the entire surface of the glass appeared yellow / amber in color. Subsequently, either the upper or lower section of the glass object returned to the furnace for reheating which created the chemical reaction in the gold that created the red coloring. The glassmaking technique can also be reversed if the lower portion of the glass object is heated rather than the top; this effect is known as reverse amberina glass. 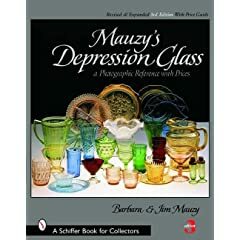 The New England Glass Co. was well known for the inclusion of multiple colors in their glass, one of the best known makers of peachblow glass, and amberina glass was also made by another peachblow maker- the Mt. Washington Glass Company of New Bedford, PA. Mt. Washington made amberina for only a few years, 1880 until about 1885, when they became embroiled in a patent suit with New England Glass Co. despite using the name "rose amber" for their interpretation of the amberina glassmaking technique. 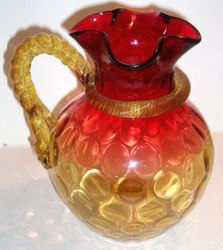 New England won an injunction in 1886 enforcing their patent, and from that point on only New England and Libby made amberina glass in the United States. Other companies were also known to make amberina glass, but they did so under license from the Libby and New England Glass patent holders; such companies included Hobbs, Brockunier & Co. of Wheeling, West Virginia. 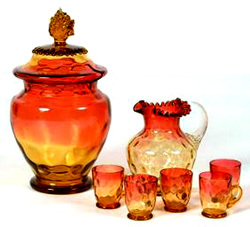 A few European companies also made amberina glass including Baccarat of France, but most amberina pieces surviving today were made in the USA. Some contemporary amberina glass is still being made today by companies such as Fenton and Boyd Glassworks. 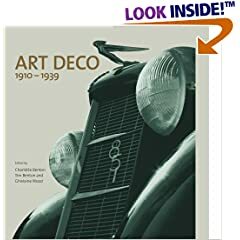 Buy period amberina, carnival, depression, EAPG, hobnail, and other finer glass and glassware on the Collectics Glass & Crystal pages, or search the entire site for great antiques, collectibles, and crafts for every collector!